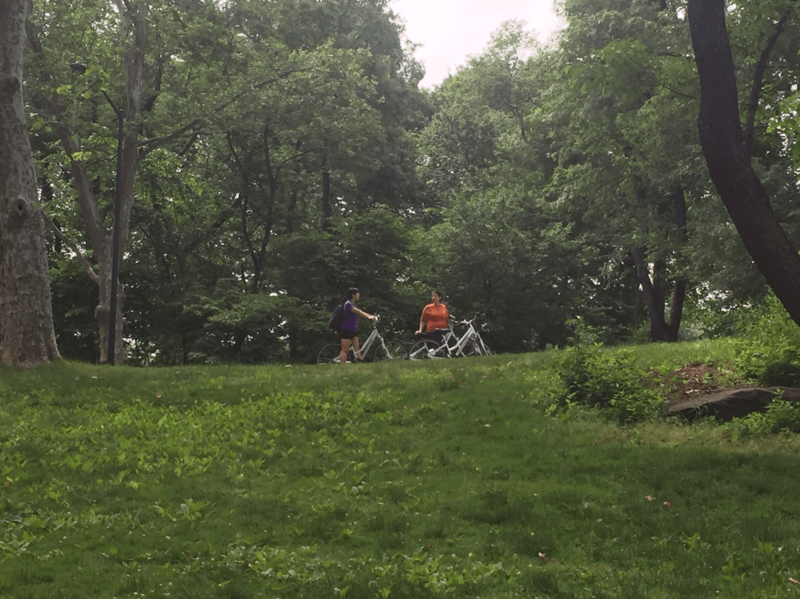 Fun Times Biking in Central Park + A Discount Code! As I have said before, Central Park is my favorite place in New York City. There is so much to see and it is beautiful all year around. It is such an oasis in this amazing concrete jungle I now call home. I spend a lot of time in the park running, picnicking, taking pictures, and attending events. However, it took me eleven years to go biking in Central Park. It was worth the wait! Anisa on her bike from Central Park Sightseeing. If you don’t have a bike at your disposal, don’t fret. It is easy to rent one at Central Park Sightseeing. They have a Central Park bike shop where you can rent bicycles by the hour, day, etc. They also have helmets (only required if you are under 14), locks, maps, and baskets if you like. 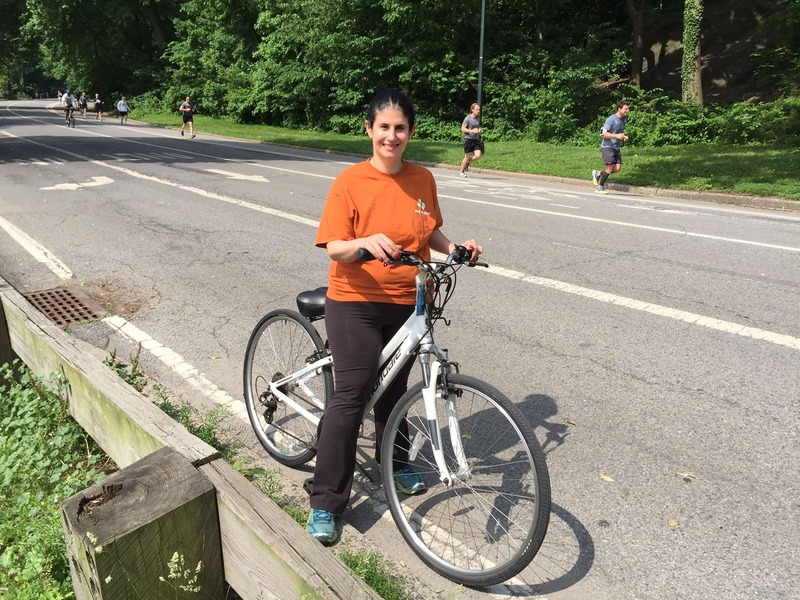 In addition to their Central Park bike rental services, Central Park Sightseeing does bicycle tours and rollerblade rentals too! They are also offering a discount code for our readers, so check out their website and use the code Tex50 to save 50% renting a bike in Central Park. They recommend booking 48 hours in advance and you will need either a valid ID or credit card for a deposit. I decided I would give biking in Central Park a try and my friends, Teju and Kerry, came along for the ride. We wanted to get to the park early so that it wouldn’t be too crowded. We arrived at the Central Park Sightseeing store a few minutes before it was supposed to open. People were already getting bikes. You could tell the operation was a finely tuned machine and they knew what they were doing. They got everyone on their way quickly. We walked our bikes to the entrance of the park. Right away, we noticed the seats seemed to have extra cushioning which was nice. Our plan was to bike the six-mile loop that goes around Central Park. This road has marked bike and pedestrian lanes so it is great for running too. Doing this route is a great way to see the park, but if you wanted to see more or less, you can ask the folks at Central Park Sightseeing for advice creating your own self-guided bike tour. The six-mile loop has lanes for biking and running. None of us had been on a bike in years, but as they say, you never forget how to ride a bike. We entered the park at the intersection of 59th St. and 6th Avenue. Inside the park, 6th avenue turns into Center Street and feeds into the main loop, just keep right when you get to the next intersection. All bikes are supposed to go counter-clockwise around the park. Those of you that have been in Central Park know it is pretty hilly. There were some challenging uphills but it was nice that there were also some nice downhill sections that where you could coast and catch your breathe. Taking a little break from biking in Central Park. The first landmark that we passed was the Mall. This is one of the most iconic spots in Central Park. From the Central Park bike loop, you can only see the beginning of it, but at this point in the year, it is just beautiful with the trees full of leaves. If you like, you could walk up the Mall and check out the Bethesda Fountain. The next notable spot that we biked by was the Loeb Boathouse. This is where you can rent rowboats and it is also a very nice restaurant. The Boathouse is a great place to have a fancy lunch and watch all the people rowing on the Lake, but we didn’t stop because we were in our workout clothes. The six mile loop goes right by the Metropolitan Museum of Art. A little further up the road you will see the Metropolitan Museum of Art on your right and Cleopatra’s Needle on your left. 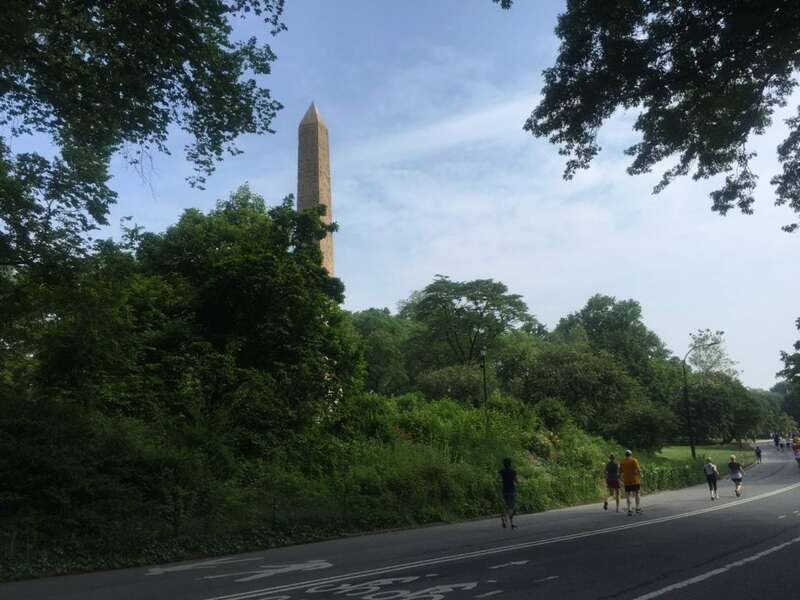 Cleopatra’s Needle, also known as the Obelisk, is the oldest man-made structure in Central Park. It was actually commissioned in Egypt back in 1350 BC and then erected in 1881 in Central Park! The Obelisk also known as Cleopatra’s Needle. Once you get to 103rd street, there is a turnoff to the left if you want to make the loop 4 miles. After 103rd St Transverse, you will hit what I call the Heartbreak (or Harlem) Hills. These are the toughest hills in the park. You go downhill first. As you go down you will see the Harlem Meer on your right. Then the long uphill starts. I have run these hills many times, and I will say that while biking them was not easy it was easier than running them. At the bottom of the biggest downhill, you see the Harlem Meer. The next landmark you pass is the Pool on your right. The Pool is one of the most beautiful spots in the northern end of the park that a lot of people don’t know about. 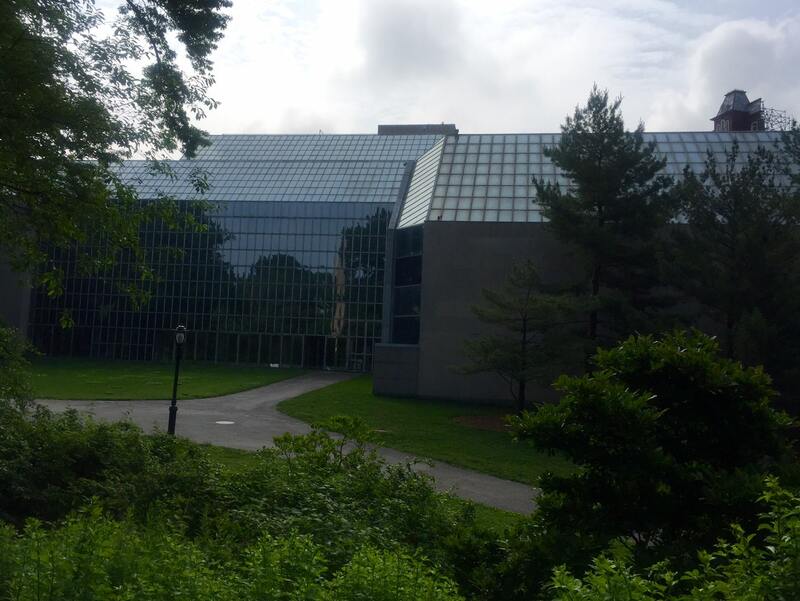 Then, you will catch a glimpse of the tennis center on your left. You can also see the Reservoir, which is a great place to go running. A little further up the Lake will be on your left and you may be able to see some people rowing. As you continue biking, you pass by the Sheep Meadow, which is my favorite spot in Central Park. Through the trees, you can see the Lake. We were having so much fun we decided to go for another loop. This time we took the turnoff for the 103nd St Transverse to make the loop a little shorter and avoid those steep hills. 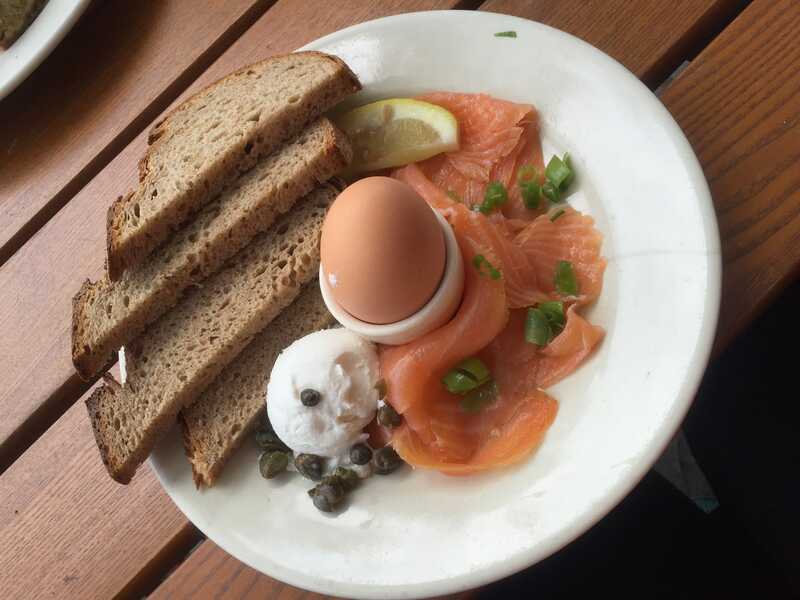 We stopped off at Le Pain Quotidien by Sheep Meadow and got a bite to eat before returning our bikes. There is a small outside seating area, and it’s casual enough that you don’t feel out of place in workout clothes. Also, I should mention that we noticed an obvious police presence in Central Park. Occasionally, we saw police cars (which would patiently wait for you to move out of the way) and also police on horseback. I think they were mostly watching out to see if anyone was injured. So if you wanted to do a Central Park bike ride by yourself, you should feel comfortable. I’m glad I finally went biking in Central Park. We had a lot of fun and got great exercise too. I will definitely do it again. Anyone else want to rent bicycles in Central Park? You can get a better idea of what it is like in my video. 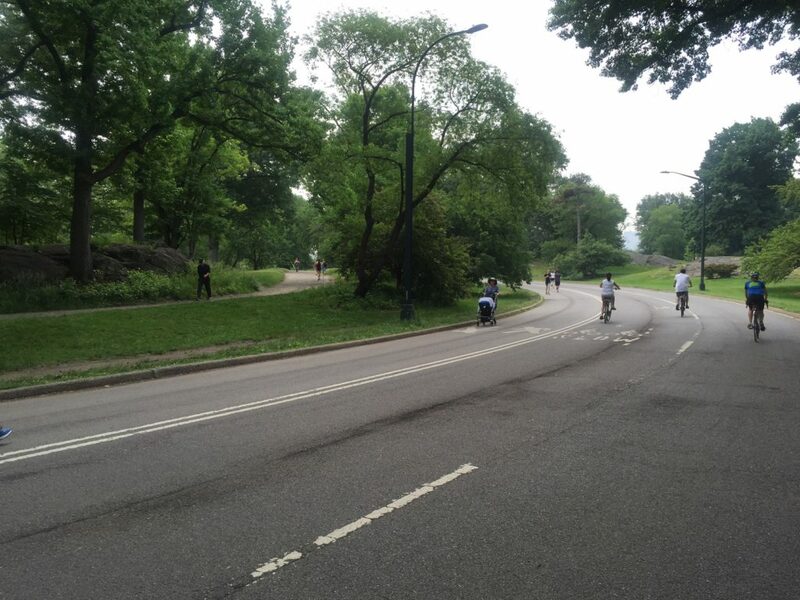 Have you gone biking in Central Park? I would love to hear about your experience and any tips. 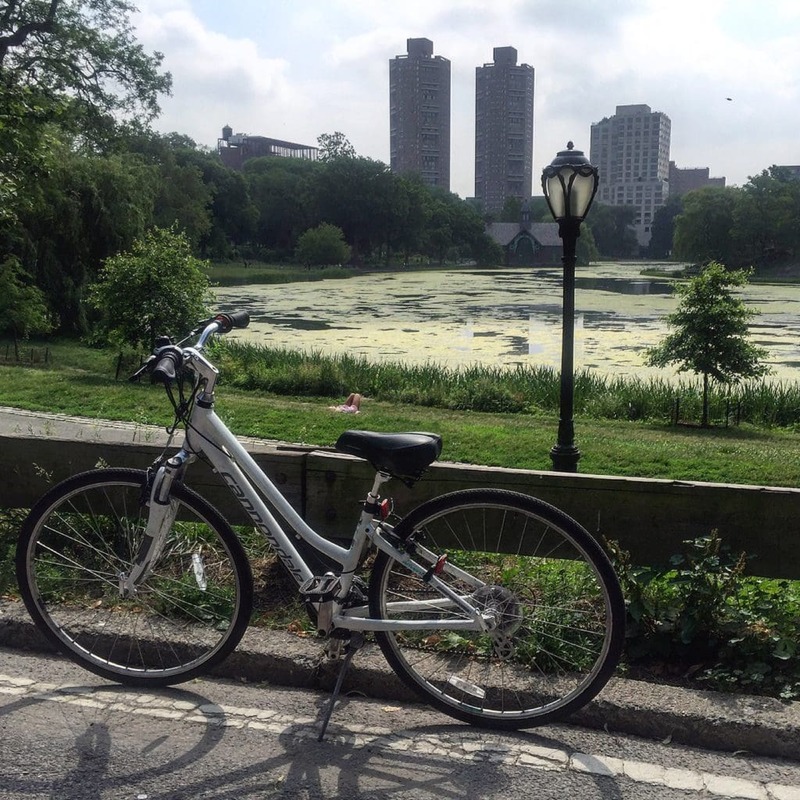 Use the code Tex50 to get 50% off your bike rental with Central Park Sightseeing. Bike Rentals are also included in some NYC sightseeing passes. Plan to go for your bike ride early, before Central Park gets crowded. Take a break and refuel at Le Pain. Disclosure: No financial compensation was received, but the Central Park Sightseeing Bike Rentals & Tours did provide complimentary bike rentals. As always, opinions expressed here are my own. Lol oh yeah I forgot about that! Thanks again for coming with me. Yes! We had so much fun last time and now I’m a better biker! Sounds like a lot of fun! I’ve been to Central Park twice but haven’t biked there yet! I’d love to do that on my next trip! There is just so much in Central Park so that’s understandable! Biking is a great way to see the park. Jen – I agree, biking in a the city seems scary. Central Park is calmer. What a nice way to spend a sunny day! Yes, biking in Central Park is fun and great exercise too. Biking sounds like a great way to see the park and get a great work-out in the process! Exactly! It is a win-win! We love getting to discover a new city by bike and would love to do Central Park some day! I’m sure you will love it. Central Park is so beautiful! 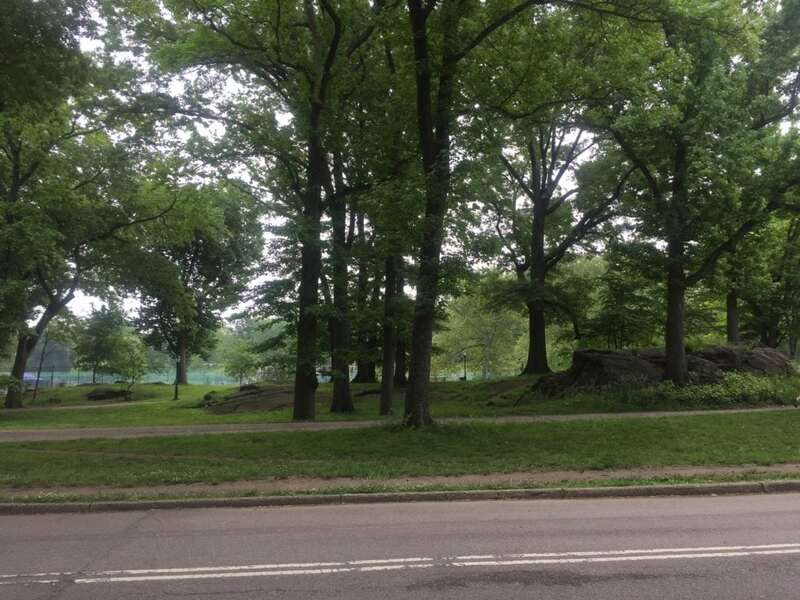 The last time I was in NYC, I was really only able to take a quick walk through the park (near the ice skating rink and this huuuuge rock). It seemed pretty impossible to take on the whole thing, but I never thought to rent a bike! Next time for sure — I’ll be able to cover way more ground. Very true, there is so much to see in Central Park! Looks so fun! I was in New York a while back but we didn’t have enough time to visit Central Park. I’ll have to go back and visit!!! Johna yes, you really must visit Central Park there is so much to see! Very nice! Yes I love spending time in the park! This is on my bucket list ? Frankie – Excellent! I hope you get to do it soon! I love Central Park! It’s such a beautiful, green oasis in the middle of the most fantastic city ever: New York! It’s most likely the perfect place for the locals to bike or do some other physical exercise. Exactly! I love it so much too! Lolo – yes! I hope you make it back and get to spend more time in NYC. One day is not enough! What a great idea! I love it. Next time I’m in the city, I probably will rent and ride through the park. Excellent! Yes I think you will enjoy it! Jessica – yes I love Golden Gate Park, actually did a post about all the stuff to do there. This is such a great idea! I’ve been to NYC 4 times but have never explored Central Park in any great detail, although I’ve been meaning to. I love how it’s an oasis in the middle of the concrete jungle of Manhattan. Would definitely love to check this out the next time I go! Michelle – yes I highly recommend visiting Central Park next time you come. It is my favorite place in the city. I have some other posts about Central Park that you should also check out next time you are here. I didn’t spend nearly enough time in Central Park when I lived in NYC. It sounds like you guys got a workout while sightseeing. What could be better? Yes. It is a win win! Need to do it more often. Thank you for the article and the great photos. I remember all those places and was about to cry. I am so glad you enjoyed it. Thank you! Nicki – Central Park is huge! Next time you’re in town I will give you a tour of some of my favorite areas.